Do you have a finished or near finished speculative fiction novel? Have you been hoping for an opportunity to dive into the slush pile of a Big Six publisher that doesn’t accept unsolicited manuscripts? Now, or rather almost now, is your chance! Harper Voyager, the scifi/fantasy imprint of HarperCollins, will be accepting unsolicited manuscripts from October 1 to October 14, 2012. We’re seeking all kinds of adult and young adult speculative fiction for digital publication, but particularly epic fantasy, science fiction, urban fantasy, horror, dystopia and supernatural. The books that are accepted will be published digitally, meaning as eBooks. The FAQ states there is a possibility these books will also be published in print. If your heart is set on your novel being in print, this might not be the way to go. However, if the idea of a Big Six publisher taking on your novel in any format excites you, I’d say go for it! You manuscript must be polished and completed by the time of submission. Harper Voyager does not accept unfinished manuscripts. Please take this seriously. Submitting your really good idea that you know they’ll just love will make you look like an amateur. Always take submission guidelines as stated. Click here to get the full scoop. Need some help with that polishing? Or are you not ready yet, but need inspiration and guidance? Below I’ve listed some writing guides that are free on Amazon today. Remember, you don’t have to have a Kindle to download these books. They can be read using the Kindle app on your computer, tablet and smart phone. Have you ever hesitated when choosing between I or me? Have you had trouble figuring out tricky pronouns like who or whom? What about those always-troublesome comas–do they go before or after the quotation marks? If you’re anything like the rest of us, you struggle with these age-old grammatical issues. In this practical and easy-to-understand handbook, Dr. William B. Bradshaw identifies the ten most common errors in English grammar and helps you to recognize and correct these mistakes, enabling you to write and speak with greater clarity in your personal and professional life. The Big Ten of Grammar is the perfect guide for students, teachers, and professionals to use in brushing up on their grammar. Professional strategies and skills by the author of two breakout thrillers: The Russian: A Spy Thriller, and Gulf Striker: A Thriller. 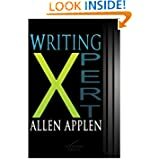 Writing Xpert is designed to encourage and instruct the beginning novelist. If you want to succeed in writing a winning novel, this book is filled with powerful ideas, tactics, and strategies—a “must have” for your book shelf. Do you want to become a successful creative writer, but are stuck in a rut? Have you tried all the methods and still find yourself coming up blank when it is time to put pen to paper? If so, then this straightforward guide is your means to becoming the creative writer that you always wanted to be. In 30 shorts days you will be on your lifelong journey to creative writing bliss and self fulfillment. This entry was posted in Free eBooks, Writing and tagged Books, Fiction, Free, Harper Voyager, Kindle, Writing by Lori Saltis. Bookmark the permalink.